Has your utensil drawer decayed into a mish-mash of semi-pointed objects in which the needed tool is always just out of reach? Admit it, it’s easy to stay unorganized when it comes to cooking tools that we can store out of sight. Perhaps the best thing might be to bring the dark corners of your utensil collection out into the light. 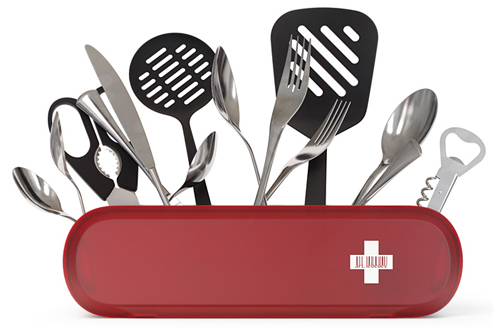 With the Swissarmius you can store all of your kitchen essentials right out in the open, organized and with style. Plus, it gives you a chance to really examine your need for owning three melon ballers. Trust me, you can let one of ‘em go.